Pear is next only to apple in importance, acreage, production and varietals diversity among temperate fruits in India. It is grown under temperate and subtropical conditions because of its wider climatic and soil adaptability. It is primarily grown in hills at 1,700-2,400 m above mean sea-level in the states of Himachal Pradesh, Jammu and Kashmir and Uttar Pradesh. Low-chilling pears have adapted very well in the subtropical regions. Pear can be grown in a wide range of climatic conditions, as it can tolerate s low as -26`C temperature when dormant and as high as 45`C during growing period. A large number of pear cultivars require about 1,200 hr below 7 C during winter to complete their chilling requirement to flower and fruit satisfactorily. However, Bartlett needs about 1,500 hr compared with other temperature pears. Pear variety Patharnakh needs only 150 hr of chilling and can also withstand high temperature and hot winds during summer. The medium chilling requiring pear LeConte, Keiffer, Pineapple, Hood and Gola perform well in areas experiencing mild winter. Spring frosts are detrimental to pear production and temperature at -3.3`C or below kills the open blossom. Therefore, lowlands should be avoided for its planting. The hail-prone areas are also unsuitable as hailstorms affect both plants and fruits. Pear grows best in deep, well-drained, fertile, and medium-textured and relatively more clay soil. It is more tolerant to wet soils but less tolerant to drought than apple. Pears even to well on poorly aerated heavy soil with high water able which is heavy in texture for most of deciduous fruits. A soil depth of about 180 cm is ideal for proper root growth and fruit production. Plants growing on deeper soils give about twice the yield than those in shallow soils. A neutral pH range of 6.0-7.5 is desirable because iron deficiency appears on highly alkaline soils. The highly fertile soils rich in N are not very suitable for pear growing as the incidence of pear psylla and fire blight is more in these soils. 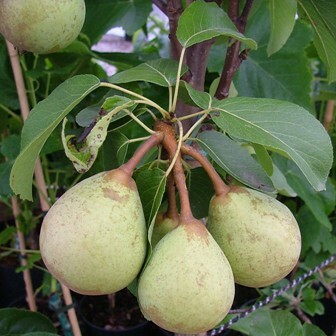 Pear varieties belong to three groups – European, Asian and hybrids. The varieties recommended for different states are listed below. Early China,Laxton’s Superb,Fertility(P),Seckel. Barlett,Starking DeliciousMax-Red Barlett,Dr Jule’s Guyot. Conference (P)*,Comice,Hardy,Winter Nellis, Clapp’sFavourite,Flemish Beauty (P). High hills: Max-Red Bartlett, William Bartlett, Conference, Hardy, Winter Nelis, Clapp’s Favourite, Flemish Beauty and Comice. Lower hills and plains: Patharnakh, Gola and LeConte. The rootstocks commonly used for propagating are pear, kainth (Pyrus pashia) and shiara (Pyrus serotina) seedlings and clonally propagated Quince. In Punjab, root suckers of wild pear are also employed as rootstock. In some areas in plains of north India, own-rooted cuttings of Patharnakh are also used for propagation. For raising rootstock, seeds of pear, Kainth and Shiara and extracted from fully mature fruits. The seeds need stratification (chilling treatment) for proper germination. The stratification can be completed by sowing seeds in open nursery in November or placing them in alternate layers with the moist sand and /or vermiculite at optimum low temperature (5`-7`C) for the required duration during October-November. The seeds are kept in the stratifying medium till the uppermost layer of seeds pushes the sand upward and protrudes the radical. The germinating seeds are sown in the beds of directly in the nursery rows immediately at a distance of 10-15cm in rows 15 cm apart. Dormant cuttings from meritorious pear trees are prepared from juvenile shoots during December. These cuttings are treated with IBA 100 ppm for 24 hours and are placed in moist sand for callusing. The callused cuttings are then planted in the nursery rows. Kainth cuttings are also prepared and treated in the same manner to raise clonal rootstock. These are later budded/ grafted. The root suckers of healthy pear trees separated during October-December with good root system. These suckers are tongue grafted and planted in the nursery at 15-20cm distance 30cm apart, leaving 60cm space after two rows. The root suckers which do not have good root system are planted in nursery rows after heading back to 2-3 buds without grafting. New sprouts come during February-March which becomes bud able during August-September. ‘Quince A’ is most commonly used clonal rootstock producing trees 50-60% of the standard size. However, this rootstock has poor compatibility with most of the commercial cultivars. Incompatibility can be overcome by double grafting with Old home or Hardy varieties. Mound layering is generally done to propagate this rootstock clonally. Pear plants are commonly propagated by T-budding during April-September or tongue grafting done during December –January. It is necessary to prepare the land by carrying out preliminary operations before planning the trees. The nature of these operations depends upon the condition of the land. If the land is already under use for raising crops and receiving adequate quantities of manure, it is suitable for planting trees. However, it should be cleared of all the old stems and roots of previously- growing trees and shrubs and be leveled properly giving a gentle slope for water drainage. A planting plan is prepared adopting a particular layout system before actual planting. The layout system depends on plant density to be adopted and topography of land. Generally, square or rectangular system is followed. In hilly areas, contour system is followed on a rolling land. In this system, first row is drawn at the highest elevation and all the trees in a row come at the same elevation. The distance between rows depends on the slope, being closer on the steeper slope. The planting distance depends upon soil fertility, cultivar, rootstock, training system and climate of the region. In hilly areas, the trees on seedling rootstock are planted at a distance of five metres but for clonal rootstocks distance can be reduced to three metres. In the planning distance of 6 m and 8 m is recommended for pear Baggugosha and Patharnakh respectively. The planting of trees can be done anytime from December to mid February in plains. However in hills, late fall or early spring are the common planting periods. In regions where winter is mild and soil has enough moisture, late fall plantings is desirable but in the contradictory conditions early spring planning is the best. A pit of 1m x 1m x1m size is dug at such places and filled with a mixture of soil and well rotten farmyard manure or compost and 30g Aldrinor BHC dust. Irrigation is given after filling pits to settle down the mixture. At eh time of planting, a small hole is dug just big enough to accommodate all the roots. Very long roots can be shortened and plant should remain straight in its position when roots are being covered with soil firmly. Pear trees are usually trained according to ‘Modified Central Leader’ method. In this method, 4or 5 well spaced limbs are developed during initial 3-4 years and then the leader is headed off. In first year, plants are headed back at 90cm low-headed trees and at 125 cm for high-headed trees at the time of planting. The lowest branch is allowed to develop at a height of 60cm from the ground level. Four or five primary scaffold braches arising at wider angle, well-spaced, 10-15cm apart and spirally arranged around the tree trunk are selected. Two to three secondary branches are selected on the primary scaffold during second dormant pruning. During subsequent years, training consists of thinning out unwanted branches and cutting others to desirable side limbs. The leader should be removed to keep a well –placed, outward growing lateral in the fourth year of training. In pruning bearing trees, a certain amount of thinning out and heading back of outward growing laterals are considered adequate. A balance is required to be maintained between fruit production and vegetative growth. Pruning intensity varies with the bearing habit of a cultivar and vigor of a tree. Pear bear fruits on spurs on two year old wood and a spur continue to bear for more than six years. The limbs with spurs over 6-8 years old need to be removed in a phased manner. The branches and new shoots are headed back to induce new growth and old fruiting branches and spurs are thinned out to maintain the vigor of the retained ones. Vigorous growth is more susceptible to fire blight. Therefore, in areas of heavy blight infection pruning should be carried out in such a way that the trees make a thrifty growth. Light pruning reduces cork spot and increases yield of desirable fruit size. In hills, dormant season, when the danger of heavy snowfall is over, is the best time of pruning. Early pruning may result in severe cold injury. In hills, the recommended dose for 10-year-old plants is 60-100kg farmyard manure, 700g N, 350g P2 O5 and 700 g K2O. The farmyard manure, P and K are applied before snowfall in December. Half of N is added three weeks before flowering and the rest half just after fruit set. The deficiency of Zn and Fe on young foliage can easily be controlled by spraying 0.4 -0.5 % zinc sulphate and ferrous sulphate respectively during April. Immediately after planting, the basins should be prepared around the plants. The level of the soil near the trunk should be kept slightly higher than the level of the basin to avoid direct contact of water with the trunk. Irrigation should be given immediately after planting. Second irrigation is applied after 2-3 days. Subsequent irrigations should be given as and when required. The young plants are staked after planning to keep their stem straight. The trunks of these plants which are not required for primary framework should be removed. The sprouts on the rootstock and root suckers should also be removed. Green Gram, mash, toria and sunflower can be grown in summer, while wheat, peas, gram and senji in winter season may be intercropped in young orchards. Additional dose of fertilizers should be given to intercrops. Peach can also be planted as fillers in pear plantations. Weeds can be controlled either mechanically by weeding and hoeing or with the use of herbicides. Hexuron 80wp (Diuron) @ 4g/ha as pre-emergence in the first fortnight of March and Glycel 41SL (Glyphosate) or Grammaxone 24 WSC (Paraquat) @ three liters/ ha as post-emergence when weeds are 15-20 cm in height dissolved in 200 liters of water are very effective to control wide-spectrum weeds. 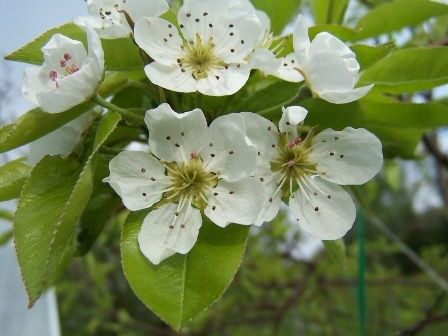 Most of the pear cultivars grown in hills are particularly self-fruitful and compatible pollenizer and must be interplanted in pear orchards. The pollenizer cultivars should have sufficiently overlapping bloom period and bear fruits of commercial value. In general, planting of every fourth tree in every fourth row as pollenizer is adequate. In addition, 2-3 bee colonies/ha are sufficient for obtaining higher yield. In heavier soils, moisture supply representing 50% or more of maximum available moisture in upper 1m is essential for maximum growth of fruit, shoot and trunk. Lighter soils or those with a gravel substratum need more frequent and heavier application of irrigation. A loam soil should be wet 1.5-1.8 m deep. In hills, pear cultivation is mostly done under rain fed conditions but at many places irrigation facility may be available which is and additional advantage. Besides rain fall, 75-100cm irrigation may be applied annually in some regions. Both excessive and scanty moisture affects color, composition and keeping quality of fruits. After harvesting in July-August, the trees should be irrigated at 20days intervals or so up to the end of October. Afterwards no irrigation is required u to January except when the manures and fertilizers are added in December. Fully mature fruits are harvested for fresh consumption, while still firm and green for canning and distant markets. For local consumption, fruits are picked at slightly later stage, because fruits hanging on trees make a considerable gain in size, weight and overall quality. However, delayed picking reduces storage life and on canning such fruits develop unattractive chalky color, turbid syrup and insipid flavour. Pear fruits are picked individually be giving a gentle twist rather than direct pull. Harvesting should be done in 2-3 pickings at 3-4 days intervals rather than single picking. 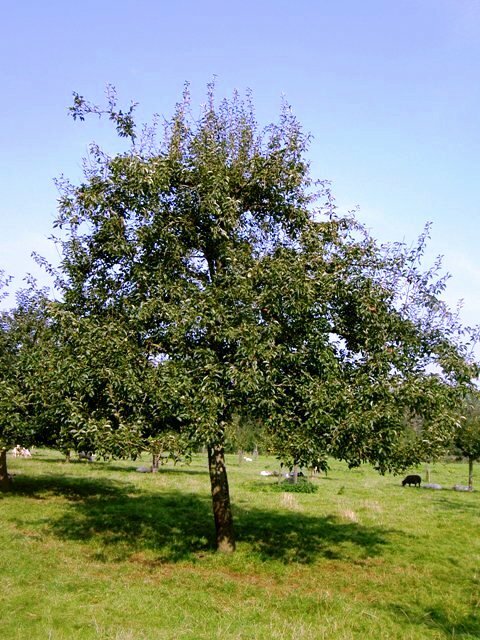 A well-managed orchard of ear Bartlett yields 30-35 tons/ha. Most pear cultivars ripen and develop best dessert quality at 15.6`-21`C and 80-85 % relative humidity. High ripening temperature (above 26`C) may impair flavour and texture of the fruits of the fruits as they become mealy and fail to ripen. Pears after harvesting are cooled to a core temperature of – 0.6` to -1.6`C to remove field heat and arrest ripening. Pre-cooling is not necessary if fruits are to be consumed within a few weeks of harvesting. Hydro-cooling reduces the incidence or shriveling and brown core without affecting weight loss or incidence of rot. Grading of fruits is very important for better returns. 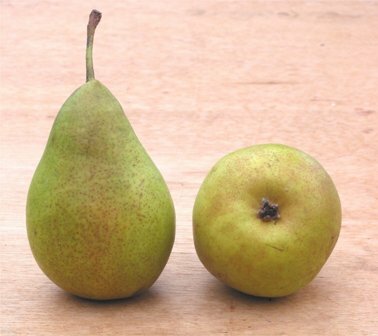 Bartlett pears are graded as extra large, large, medium and small having 8, 7, 6.5 and 5cm respectively. These grades are also known as extra class, class1, class 11 and class 111. The misshapen, damaged, blemished and scared fruits should be excluded while grading. The wooden, plastic or cardboard boxes are generally used for packing pears. The fruits should be packed in layers. The bottom and top of the containers are properly cushioned with newspaper or dry grass for avoiding compaction and bruises to fruits. The fruits can also be wrapped individually in 10 micron HDPE bags before packing which maintains freshness and improves fruit quality compared with unwrapped fruits. Labeling of boxes indicating grade, cultivar and name of the orchard should be pasted, printed or stamped on the container. Pears can be stored for 120-245 days at -1`C and 85% relative humidity. Premature ripening begins with pink coloration near the blossom end. Consequently core breakdown (brown heart) and softening occur in affected fruits which do not ripen properly. This disorder is caused by abnormally cool growing season preceding harvest. Night temperature lower than 7.1`C and day temperature lower than 21`C for a few days are sufficient to cause premature ripening. As soon as the initial symptoms appear, the fruits should be harvested and handled normally.